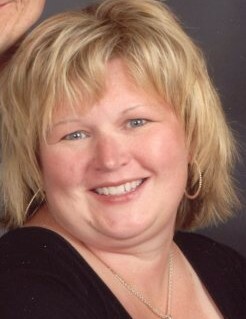 Cheryl (Goodman) Bronson, age 50, of Tipton passed away peacefully on Sunday, March 31, 2019, surrounded by her family and friends. Cheryl was born, in Tipton on July 16, 1968 to Michael and Lin (Borden) Goodman. Cheryl was a 1986 graduate of Tipton High School. She then went on to earn an executive secretarial degree at ITT Tech. This degree led Cheryl to an amazing job that she loved, working as office manager for Dr. Thomas Whitten for the past 17 years. On November 19, 1994 Cheryl married the love of her life, Bill Bronson, he survives. Bill and Cheryl enjoyed the attributes of a biblical marriage, and their love is an inspiration to many. Cheryl loved vacationing with her husband. Michigan was their special place, but anywhere Cheryl could find a beach she was happy. She also loved taking joy rides in her husband’s 1932 Roadster. Cheryl was truly a woman after God’s own heart, and in her pursuit to please Him, she served in many positions through the years. Cheryl was a deacon at East Main Street Christian Church, she participated in Relay for Life, and she was also Head Community Agape for the Heartland Great Banquet. Cheryl was a friend to anyone and everyone who crossed her path, but she had a special group of friends, that she loved to spend time with, called the Fiesta Sisters. She poured love into these lady’s lives and they did the same for her. Cheryl was loved by all who knew her! She was a passionate woman, who lived to please God. Children and young people were drawn to her. She was called Miss Cheryl, or Aunt C. by many, this is no doubt because of her nurturing and caring heart. Cheryl was one in a million and will be so greatly missed! Those left to carry on Cheryl’s legacy of love are her husband, Bill Bronson; parents, Michael and Lin (Borden) Goodman; brother, Brian (Tony) Goodman Holliday; sister-in-law, Susie (Andy) Hussong; niece, Shelby Goodman; nephews, Tristian Goodman, Korbin Hussong, Kurtis Hussong, Kaden Hussong, and Kellen Hussong; God children, Fantaye, Hymie, and Teme Moody, and Trey Morris. Additionally, Miss Cheryl had a very special place in her heart for Dr. Whitten’s children, Sydney, Michael, Bren, Sarah, Tommy, Hope, Tessa, Sophie and Annie Whitten. Cheryl was preceded in death by her grandparents, Allan and Florence Goodman and Lawrence and Melba Borden. A funeral service celebrating Cheryl’s life will be held at 1:00pm on Thursday, April 4, 2019 at East Main Street Christian Church, located at 1801 E. Main St. in Elwood, with Pastor Roger Gardner officiating. Burial will follow at Tipton’s Fairview Cemetery. A visitation for family and friends will take place from 4:00pm to 8:00pm on Wednesday, April 3, 2019 at Taylor & Cowan Funeral Home, located at 314 N. Main St. in Tipton. In lieu of flowers, memorial contributions may be made to the American Cancer Society or the Susan G. Komen Foundation. Please feel free to leave an online condolence or share a special memory of Cheryl with her family on her tribute wall.